Did I not work? Didn't I work? Did you not work? Didn't you work? Did he not work? Didn't he work? Did she not work? Didn't she work? Did it not work? Didn't it work? Did we not work? Didn't we work? Did they not work? Didn't they work? 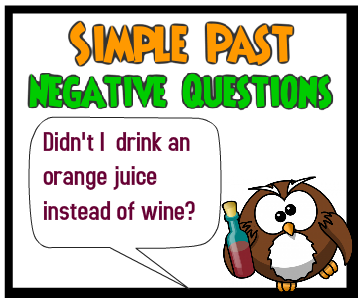 Change the following statements into NEGATIVE QUESTIONS either with or without contractions. She went to the party. Didn't she go to the party? Did she not go to the party? 1. Didn't she hurry to school? / Did she not hurry to school? 2. Didn't they carry the parcels? / Did they not carry the parcels? 3. Didn't you close the door? / Did you not close the door? 4. Didn't they plan the party? / Did they not plan the party? 5. Didn't she tell a story? / Did she not tell a story? 6. Didn't they shake hands? / Did they not shake hands?